This is the 3rd time in which Dragster has been balanced on the tophat with people. Does anyone have any video footage of this besides the two videos on Youtube? Was anyone there when it happened? Have any other rides like this ever been stuck? An answer to any of these questions would help! lol, i was there on monday. i was so jealous. I suspect any video out there looks just like a still photo. Several people on PointBuzz were there. So what happens at that point? Do you wait for a strong gust of wind or is there a way to give it a little kick? That's why you have to shoot video...so that you can tell the difference. When the bird goes by, you can tell. ^^Maintenance rides an elevator up the tower and hand-pushes the train over the top. So, if a roll-back on TTD is the "golden ring" of roller coasters, is this the "platinum ring" or "diamond ring"? What about a double roll-back? I thought they had a kicker wheel up at the top just for such an occasion. Am I wrong? ...but, after a few more of these, I'm sure someone will wish there had been. Kicker wheel will not work, not enough force to overcome the static friction of a heavy train. Unless you know the static friction of the train and the force the kicker could exert on the train before the wheel itself would slip, how could you assume that it could not overcome the static friction? Plus, they could always use more then one set of wheels... I would not say it would not work, there is *always* a way. There is a way, but not with a rubber tire assuming the train is at a full stop. All those tires you are thinking of in the station/break runs operate because the train already has started moving, the friction is much less when that happens. The kicker might be able to run if the train drops below say 5mph then it would not have to over come stopped friction. Aren't the trains moved off the transfer with two kicker wheels? I don't understand what the objection is. I did like the cedar point blog post about it. At least someone takes it lightly on the 25 million investment that wasn't guaranteed to work. That would be an interesting one though, but the rollback gives more bang for the buck. 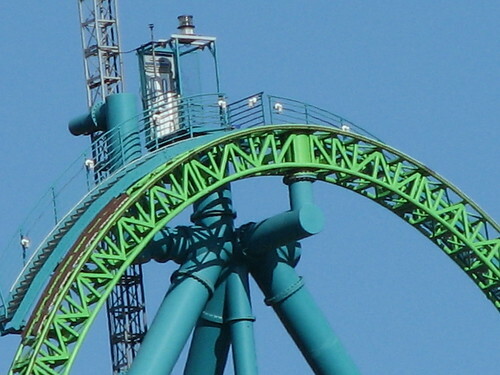 I'm pretty sure Kingda Ka has some type of LSM system that gives the ride a boost if it needs it. Those are static brass fins, like those found on the dark side of the camel hump. Im pretty sure that the transfer track is at an angle so that the train rolls down it from its storage track.